A couple of weeks ago, I saw the Pioneer Woman doing a herbed pork tenderloin. Fortuitously, the next week at the market, they had pork loin on sale! Obviously, the stars were in alignment for me on that day. The trick to this is really getting the loin to cook without sitting in the juice at the bottom of the pan and getting soggy. It’s really hard to call it a crust if it slumps off into the pan the minute you try to serve it! I don’t have a roasting rack, which would be good for this, so improvisation was in order. 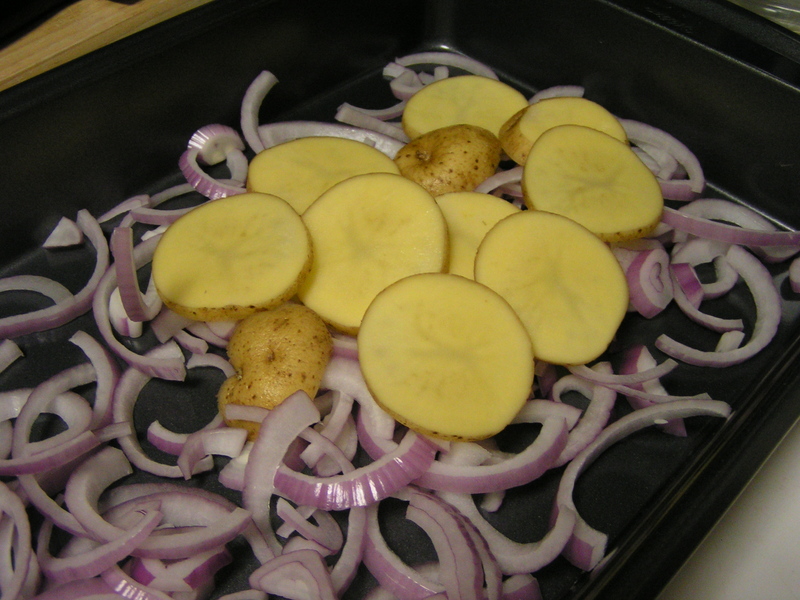 I sliced potatoes and onions very thinly and put them in alternating layers in the bottom of a 9×13″ pan. The layers optimally will be about 2 inches thick. Drizzle oilve oil, salt and pepper over your potaot foundation, cover, and bake at 350F for about 30 minutes, until the potatoes are just beginning to get tender. Rub the loin with olive oil. 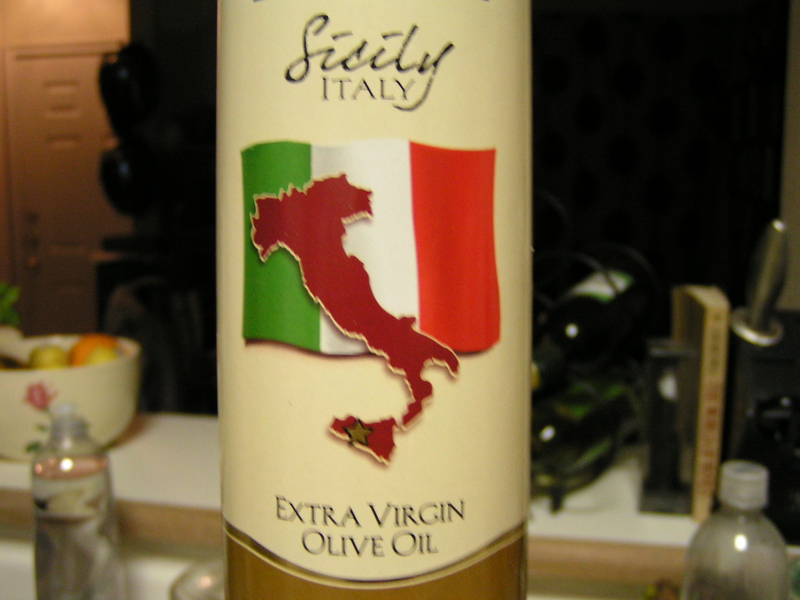 For this, i eschewed my favorite roasted garlic infused oil, and just used a good grade of Sicilian olive oil. 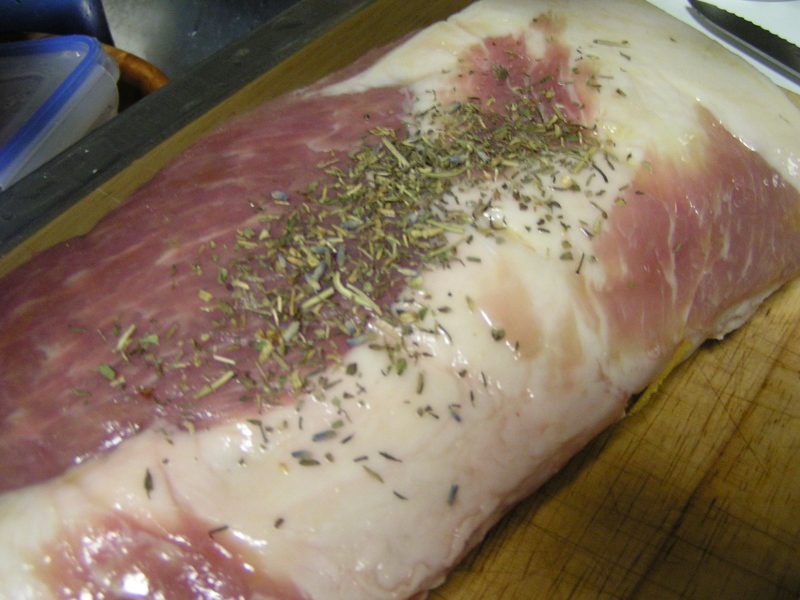 Rub the loin generously with the oil, and begin to pat the herb mixture onto the meat. The herbs should stick in a nice thick layer. 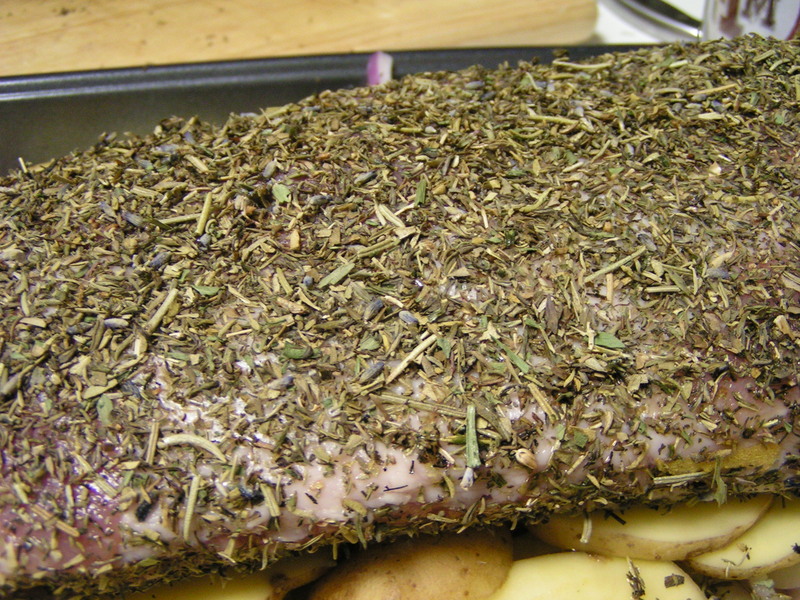 I used Herbs de Provence, because I particularly like the mix of rosemary, thyme, basil, savory, and oregano. It also looks pretty. If you notice some bare patches, just get a small handfull, and press it onto the meat. Then lay the loin on top of the potato and onion foundation. 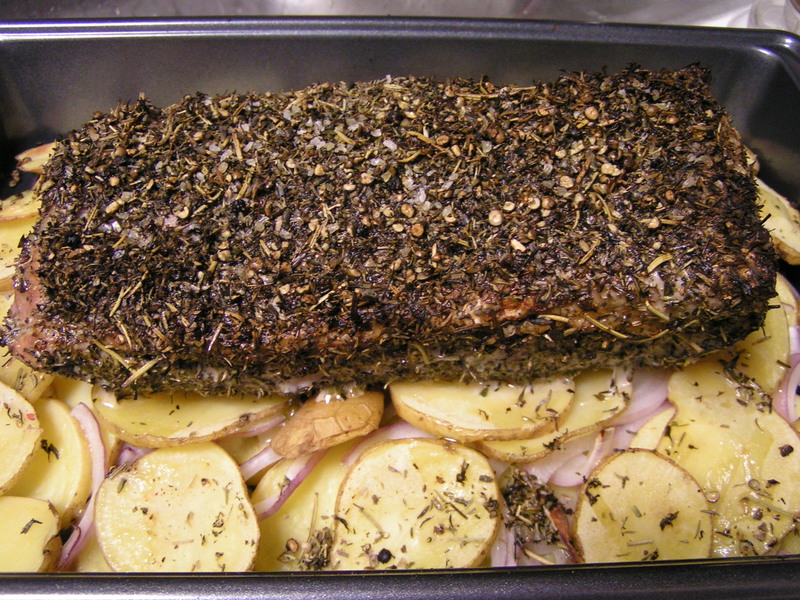 Do not cover, as you don’t want to steam it, you want the herb layer to form into a crisp crust. Bake at 400F for about 35 – 40 minutes. Cover and rest the whole thing for about 5 – 10 minutes. 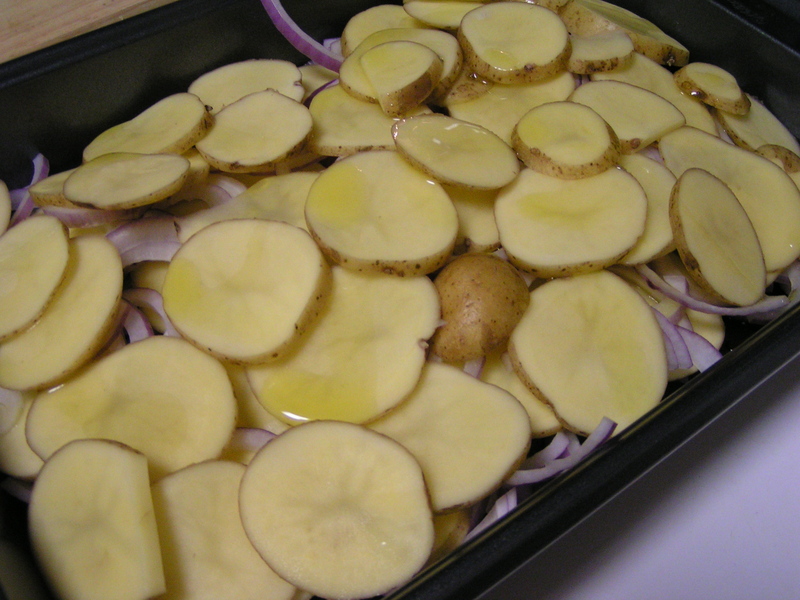 Then slice and serve with the potatoes and onion base, which will have now absorbed a bit of the herb flavor, along with some pork drippings. Yum! 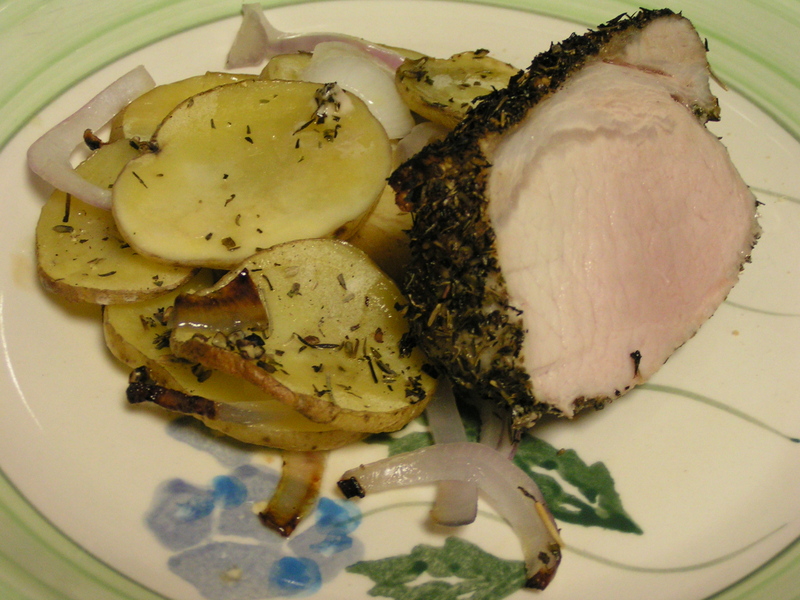 I do use the layered onions and potatoes for the loin, and cover the loin in EVOO, lemon pepper, and herbs de provence. It turns out very well! Looks delish. In lieu of a roasting rack, I use a cookie rack (cooling rack) that fits in my roasting pan.